Mary Green looks back at wildlife seen in the past year. We had our “St Luke’s little summer” a bit early this year, with beautiful golden weather at the end of September and early October. It really was “mists and mellow fruitfulness” this year. My damson tree seemed to visibly stretch itself and rise up when I had finished picking off the weight of damsons from it. The damson gin should be perfect for Christmas – and there are still plenty of sloes to go at! And I was right to think the oaks would have a good acorn harvest: it is very bountiful this year. Hawthorn and holly were both full of red berries in October. In folklore, this is supposed to mean food for birds in a harsh winter to come, but it is actually more to do with the weather pattern over the last year. However, some meteorologists are predicting a cold winter this year (something to do with El Niño) so who knows? Early November’s traditions are really the same as those I described for late October. Guy Fawkes Day took over the traditional bonfire that used to be lit on All Hallows’ Eve, and before that at Samhain. We used to make our “turnip lantern” for Guy Fawkes out of a mangel, a kind of beet fed to cattle. November also holds St Catherine’s Day, now famous for the firework named after her. In past times one of the most important November days was Martinmas or St Martin’s Day on November 11. This was traditionally the last day to slaughter animals to preserve meat for the winter. It meant that it was also the last chance to eat fresh meat, especially the offal which wasn’t preserved, so was quite a festive time. In some places it replaces Michaelmas as the “settling day” or quarter day. Killing chosen animals meant they didn’t have to be fed in the harsh winter. Not long after Martinmas comes the American festival of Thanksgiving, another feasting day and one that is sometimes borrowed now in the UK. It is the family reunion emphasis of the celebration which people find so attractive, I think. And there are certainly plenty of pumpkins this year! Right at the end of the month is St Andrew’s Day, celebrated of course in Scotland still. Traditionally there were some English celebrations as well, including, rather oddly, going into the woods to hunt and kill squirrels. As well as a form of pest control (and providing food) it has been suggested this was often a way of maintaining people’s right of access to woodland, which was once vital. I was up in Cumbria in the Howgill Fells in late September and was delighted to see red squirrels. There was even a red squirrel society in the nearby town, dedicated to their survival. Meantime, some conservationists are encouraging the eating of grey squirrels as a good way of controlling them and making use of them. Grey squirrels are of course a threat to the older red kind, though I must admit to liking to watch their acrobatics in the local trees. We saw partridges there too, as well as the more common pheasants. And the farm we stayed on had some fine turkeys, which made me think of Thanksgiving and Christmas. There was also a “sheepfest” going on in the town, celebrating how the history of the area was built on sheep and their wool, and still is to some extent. Like most farmers now and in the past, the one we stayed with had to earn from tourism over and above his sheep farming. There was a tradition of large-scale and domestic cloth making in the area, and especially of knitting. One village, Dent, had the “terrible knitters” – so called because they were so good at it – who supplied gloves and socks to the army through the Napoleonic and later wars. It’s just another example of how farming has always been diversified, with one person in the household often employed in manufacture or mining or working on roads: you meet it all over the country. Today this also extends to farmers working for conservation and restoration of the local ecology, with the help of grants. I am writing this in October during National Wool Week, which reminds us of how wool was once the source of wealth in much of our country. Tiny villages throughout the country have huge churches as testament to these riches. 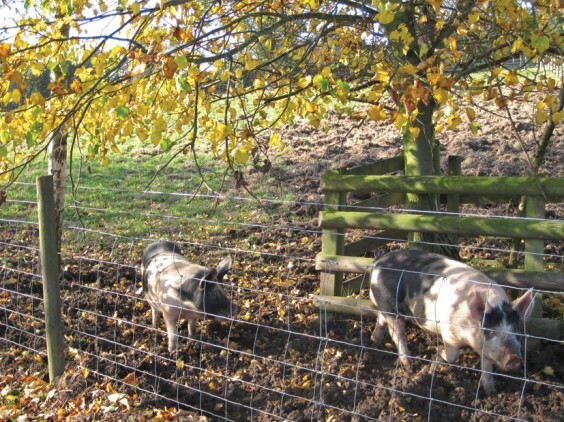 Sheep, cattle and pigs are familiar to us as the animals of our countryside. Nowadays there are some less familiar ones. I found a herd of alpacas in Cumbria which reminded me of our local ones in Rowney Green. There are local farms here with guinea fowl and turkeys as well as the more traditional ducks, geese and hens. And among the cattle are good old local breeds like Hereford, and the really traditional longhorns. Old breeds of pig have come back too, like Tamworths and Old Spots. Sheep vary across the country, and in Cumbria we saw the local Fellside sheep and some of the old Herdwick breed. There were still local spinners, knitters, weavers and felters of wool, but now for the more expensive tourist market. I have been looking back over animals and birds I have see during the year (as a change from plants!). I’ve noticed that my sightings of deer are quite frequent. Round here we see mostly roe deer or the little muntjac, but there are some fallow deer around too. One day I was walking up Birches bridleway near Withybed when I saw a roe deer walking up ahead of me. It didn’t seem afraid and just kept ahead of me till it leaped into a field at the top. In some parts of the country deer are a problem. There are no predators on them, and they are no longer hunted, so they can breed uninterruptedly. Round here they are just a bit of a nuisance, but they can cause havoc to crops for farmers. But where they are more common, especially in open upland areas, they also affect the local ecology quite dramatically. This often happens in areas where sheep are also grazed on uplands. With both the sheep and the deer, the growth of native plant life is limited. In particular, trees don’t get a chance to grow, but also the range of wildflowers is less. I have seen the effects of this both in Cumbria and earlier this year in the Outer Hebrides. It doesn’t harm the beauty of the countryside. In fact the grass-covered Howgill Fells are especially attractive, and quite easy to walk on. But the only trees are in the very deep stream gorges or the shelter-belts around farms. Similarly, the wind-swept Hebrides are beautiful, but lack of trees makes them ecologically limited. In one part of Scotland, Coigach, which I have visited often, they are trying to reverse this. They are keeping deer and sheep off the open hillsides and replanting with native trees, as well as encouraging native mammals and birds to re-colonise. Some naturalists want to go further than this, by reintroducing predators like lynx, bear and wolves to get the balance back. This would be difficult anywhere that people lived, I think, so may only be possible on reserves. But beavers have come back to some rivers and seem to be producing beneficial results for the local ecology. And there is a big move to save the now-rare Scottish wildcat, threatened among other things by interbreeding with feral domestic cats. I suppose it’s all a reminder that nature can’t keep its own balance once we have intervened, and we have to make decisions about how to try to keep it. It seemed to me to be quite a good summer for butterflies, though many people say there were fewer this year. This may just be because you need a good sunny day to see them out in force, and we didn’t have too many of those in July and August! You also need to be in a place with good nectar-producing flowers to see them. They were still going strong in the nice sunny September days we had. I especially noticed the common blue butterflies this year. I see these most years in Eades Meadow, but this year I have seen more around Alvechurch. They like the plant family that includes vetches, clover, trefoil, medick and melilot, which explains why there were so many on the new patch of wildflowers that has appeared along the canal near the Station Road bridge in Alvechurch. I also noticed this year the reappearance of brimstone butterflies later in the summer. These are the butter-coloured ones that probably gave us the English name. They usually come in spring, one of the earliest to appear. They hibernate over winter as an adult. Their preferred food plant is buckthorn, not very common, so they are not common either. I always see them in my garden in spring, but this year I saw several in the late summer, a second brood emerging, presumably the ones that will hibernate. Many butterflies have second broods. One of the interesting ones you might see in the autumn is our other relatively common blue species, the holly blue. This can be seen fluttering around holly flowers in May, but the second brood is attracted to ivy flowers in the autumn. One place where I saw lots of butterflies and bees was in the piece of the original Crown Meadow which lies between the main canal and the dead arm. It is the nearest we have to a wild place here, having been left to return to native scrub for at least 30 years, and has a great variety of wild flowers and shrubs, as well as young trees. It also has some great sloes and blackberries. This summer it was full of insects of all kinds. Many people have mentioned the lack of wasps this year, but I had plenty around in October! However, they didn’t seem to be so common earlier, and I have found out that their numbers have tumbled over recent decades. Wasps are carnivorous in the grub stage, feeding on aphids and tiny caterpillars – they only switch to eating sugars later on as adults. So their decline is probably due to a decline in these other insects, the whole thing caused by loss of their habitat and use of pesticides. If you feel happy not to have wasps, therefore, try to miss them a bit more. And in autumn people always ask why there are so many spiders. It’s because they come out then and search for mates – they are always there but we don’t always see them! The Withybed Poets read on National Poetry Day to a Sight Concern group in Bromsgrove. My poem is one on the theme of dreams that the Withybed poets wrote about recently. My depths must be very shallow. Or in the open without walls. Teaching a class who riot in front of me. None of these things have happened to me, I add. That maybe I should have married a plumber. Or having a baby and leaving it behind somewhere. These are all common, I gather. And now the unthinking biscuits. That real life is much more fun than dreams.